What Are the Potential Benefits of Sesame Seed Oil? Historically, sesame oil has been used as an anti-inflammatory, antiseptic and pain reliever in skin conditions, gum disease and a variety of other illnesses. Modern science now knows that sesame oil is a powerful antioxidant (a substance that reduces the presence of harmful chemicals in the body), high in polyunsaturated fats and an excellent source of vitamin E and minerals. Sesame oil, in fact, has the fourth-highest concentration of polyunsaturated fats of any oil. Polyunsaturated fats are important for cell growth and development and are especially beneficial to the heart. Polyunsaturated fats are also thought to be important in the prevention of illnesses such as diabetes, heart disease, high blood pressure, arthritis and autoimmune disorders. Because sesame oil is a natural, readily attainable source of these important polyunsaturated fats as well as its vitamin and antioxidant properties, it has begun to pique the interest of traditional Western medicine. Sesame oil has been the subject of multiple clinical studies and continues to be examined as a potential treatment for cancer, menopause, gum disease, high blood pressure and heart disease. What Vitamins Are in Sesame Oil? Sesame seed oil is an excellent source of B-complex vitamins. 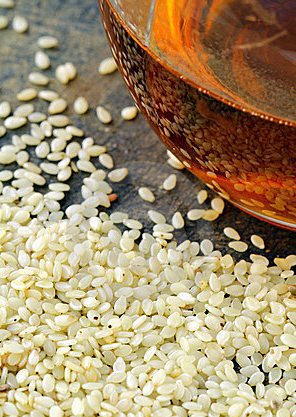 Humans have used sesame seeds as a tasty cooking oil for thousands of years. However, sesame oil's health benefits for the skin have come to light in recent decades. In addition to fatty acids and antioxidants, sesame oil contains vitamins and minerals, and it can be a valuable addition to a healthy lifestyle. Sesame oil is high in vitamin E, containing 75 percent of the recommended daily allowance in 1 oz. It also contains sesaminol and sesamin, which help increase vitamin E activity within the body. Vitamin E helps reduce the risk of heart disease and may protect the body from cancer. Sesame oil is high in multiple forms of B-complex vitamins, which promote healthy development of several different systems in the body. 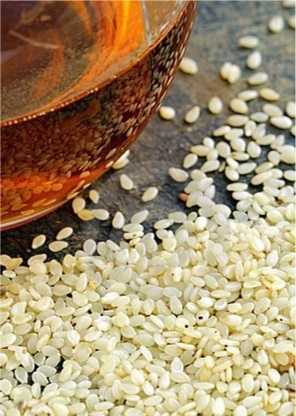 B vitamins contained in sesame oil include thiamin and riboflavin (B1 and B2--for overall energy level), niacin (B3--for skin, nerve and digestive health ), pantothetic acid (B5--for overall growth and development), pyroxide (B6--for nerve, blood and immune system health) and folic acid (B9--for DNA and red blood cell health). 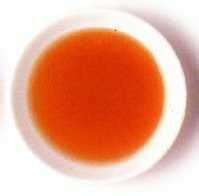 Sesame oil is high in monounsaturated and polyunsaturated fatty acids. These fats are high in omega-6, which can help prevent and treat multiple diseases. It is also high in amino acids, which build up proteins. Sesame oil is also high in minerals. It contains the elements of calcium, copper, iron, magnesium, manganese, phosphorous, selenium and zinc. These help strengthen muscular and skeletal development.